I've never been to Tokyo. I've not had an interest. It's never been in my plans. 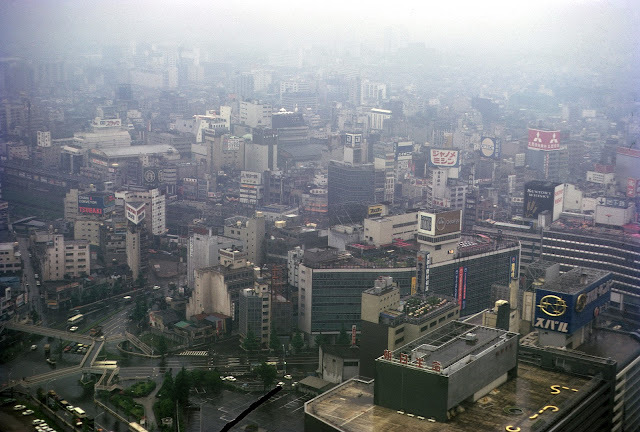 In an odd way this is a mesmerizing view of a damp Tokyo skyline taken from high up the Keio Plaza Intercontinental. The damp surfaces add a lot of depth to the image and the mist confines the view so it feels almost intimate. It's a shame we have as much of the roof and air conditioning unit in the foreground but if it were tighter then we would miss all the intricate pedestrian walkways in the bottom left. This is a full page spread in my blurb book and works really well.